The Monster family grows with a new version that becomes the most special of history and power components, in addition to price. Ducati has surprised the world with the most powerful and sophisticated Monster history. The twenty-five years that the model meets the coming year they deserved some kind of celebration, and Bologna have chosen to stage a version with engine boosted to 160 hp and “Pata Negra” components in its chassis, as well also incorporate other specific elements that distinguish it from its sister series. The Italian brand has taken advantage of the celebration of the Frankfurt auto show now that belongs to the Volkswagen Group to present to the new Monster. According Ducati announced in the official statement, the two-cylinder Testastretta 11° Dual Spark that propels has been provided with a few bodies of admission of oval section, which is equivalent to a diameter of 56 mm, representing an increase of 3 mm from those of the Monster 1200 we knew so far. Also mounted an unprecedented exhaust system type “2-1-2” with pentagonal section mufflers and 58 mm thick. In addition, compression is increased to 13: 1. With all this and other reforms less relevant, Ducati states a maximum power of 160 hp, 15 hp exceeding to the “S” version and 25 hp to normal. The components of the part cycle of this 1200 R largely coincide with those of the 1200 S. Thus, a equip of front mounted Brembo brakes with biting huge 330 mm discs by M50 monobloc Calipe of radial anchoring and a Ohlins inverted fork with 48mm bars (although in this case with anodized in black bottles). Also the rear shock and steering damper are the same Swedish manufacturer. Where if you uncheck the ‘R’ is on rims, forged aluminum mounting a three triples clubs who are very light. Likewise are remarkable tires Pirelli Diablo Supercorsa SP that fit with the rear in measures 200/55-17″, 10 mm wider than that of their sisters. Another distinctive aspect of this new version is the holders of the stirrups of the pilot and passenger. They are now manufactured in machining aluminium and are independent to allow removal of the rear easily. Also the front brackets are located a little higher to give a greater angle when cornering. Similarly, the new Monster 1200 R is distinguished by mounting a Sport type seat with a specific nameplate of the model, which is accompanied by a single-seat cover new design with more angular than the sibling forms. 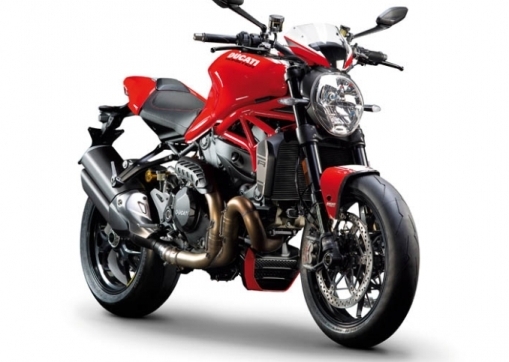 With all this, the Monster 1200 R stands as a very sophisticated supernaked therefore incorporates a Ducati Safety Pack with three driving modes (Sport, Touring and Urban), ABS with three levels of performance and traction control with eight levels, these latest two devices being disconnectable. Its implementation of TFT color also contributes to make it a very special bike. With respect to its availability and price, yet we have not been informed exactly, but it will not take long to arrive and the cost will be around 20,000 euros.